One of the pitfalls of trying to master a new skill on your own is that you can easily miss something quite fundamental without someone to give you guidance. Over the past few months I’ve been wondering why my uploaded photos don’t look as colorful as they do on my computer. Fortunately today I encountered a blog post that told me exactly why. 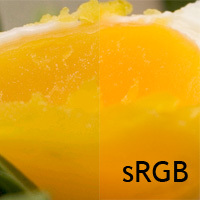 Turns out that I have been using the AdobeRGB colorspace for everything when I should be converting an image to sRGB before saving it for upload (sRGB is the colorspace that a web browser uses when it renders images). I have a lot more to learn before I get really competent processing RAW files. So, I apologize. Look forward to more colorful pictures in the future! Jen hates vegetables. It’s a struggle for me to get her to eat them. Bacon salad is a compromise, which is why I made it on Valentine’s Day (along with the gorgeous high-roast chicken). On the one hand, it has spinach leaves, eggs, and red onion. On the other hand, it has 10 strips of bacon and the dressing has three tablespoons of bacon fat. It is quite delicious, but I will only be breaking out the bacon fat salad dressing for very special occasions. Oh man, it makes me sick just thinking about it. 2. Fry the bacon in a medium skillet over medium-high heat, stirring occasionally, until crisp, about 10 minutes. Using a slotted spoon, transfer the bacon to a plate lined with paper towels. Pour the bacon fat into a heatproof bowl and then return 3 tablespoons of the fat to the skillet. Add the onion to the skillet and cook over medium heat, stirring frequently, until slightly softened, about 3 minutes. Stir in the garlic and cook until fragrant, about 15 seconds. Add the vinegar mixture and remove the skillet from the heat. Working quickly, scrape the bottom of the skillet with a wooden spoon to loosen the browned bits. 3. 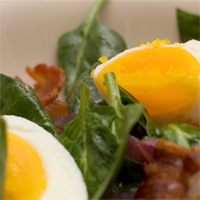 Pour the hot dressing over the spinach, add the bacon, and toss gently with tongs until the spinach is slightly wilted. Divide the salad among individual plates, arrange the egg quarters over each, and serve immediately. Oh man. It is real. And I’ve been waiting for it. If it has more than two-way multiplayer, it may replace Mario Kart. I can’t wait for this. For those of you who won’t know, Tetris Attack/Panel de Pon/Pokemon Puzzle * is my favorite multiplayer puzzle game, despite the fact that my sister can usually beat me at it. A few friends I’ve talked to have been interested in getting a DSLR, so I figured that I’d pass along this piece of advice: seriously consider getting a Nikon because of the 18-200mm 3.5-5.6 VR (vibration reduction) lens. It can be purchased for $750 if you are lucky enough to find it. Sounds like a lot of money, but on the Canon side (if a competitor isn’t released) you’re looking at buying 2-3 lenses and switching between them to get the full range. Glowing reviews describe it as life-changing (1, 2, 3). The lens isn’t perfect (reviews mention some distortion at the focal length extremes and build quality isn’t the best), but overall it sounds awesome. Three of the guys at work have managed to get their hands on one, and a fourth is not far behind. This past week I’ve almost exclusively been snapping away quite happily with my cheapest lens, the good ol’ Canon 50mm 1.8. It feels like a plastic toy and is very loud when it focuses, but it does take some nice pictures. It’s also very small, which makes it easy to take around. 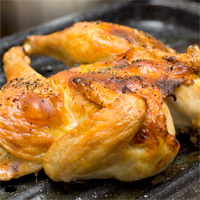 A few months ago ATK featured a recipe for high roast chicken. It looked so unbelievably good that I knew I had to make it. It ended up being Valentine’s Day dinner. The chicken is cooked at 500 degrees F on a broiler plate; thinly sliced potatoes layered inside the plate soak up all of the juices that drip down. When I took the chicken out of the oven, I was very impressed by its beautiful brown color. The skin was very crispy and the meat was tender and flavorful. The potatoes were tasty as well. This is definitely going to be prepared again soon; not only was it amazingly good, it only took 45 minutes in the oven. To butterfly the chicken, cut along both sides of the backbone starting from where the neck begins with kitchen shears. Lay the chicken on a flat surface, breast side up, and press down hard along the middle of the breast to break the bone and flatten it out. The flavored butter I used contained rosemary, pepper, and mustard. For the potatoes, I used our mandoline for the first time. It was a gift from Ellen during Christmas 2005, so I’m glad it was finally put to good use. Some of the nicely browned potatoes stuck to the bottom layer of foil because I didn’t oil it enough. 1. Dissolve the salt and sugar in 2 quarts cold water in a large bowl. Immerse the chicken in the brine, cover, and refrigerate until fully seasoned, about 1 hour. Meanwhile, adjust an oven rack to the lower-middle position and heat the oven to 500 degrees. Line the bottom of a broiler pan with foil and spray with vegetable cooking spray. 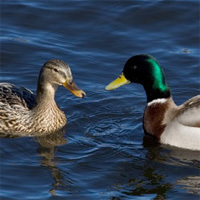 Remove the chicken from the brine and rinse thoroughly under cold running water. Following the illustrations on page 317, butterfly the chicken and flatten the breastbone. Apply the flavored butter (if using) by slipping your fingers underneath the skin of the breast and legs to loosen the membrane and rub the mixture beneath the skin. Position the chicken on the broiler pan rack and push each leg up to rest between the thigh and breast; thoroughly pat dry with paper towels. 2. Toss the potatoes with 1 tablespoon of the olive oil, the salt, and pepper to taste in a medium bowl. Spread the potatoes in an even layer in the foil-lined broiler pan bottom. Place the broiler pan rack with the chicken on top. Rub the chicken with the remaining 1/2 tablespoon oil and sprinkle with pepper to taste. 3. Roast the chicken until spotty brown, about 20 minutes. Rotate the pan and continue to roast until the skin has crisped and turned deep brown and an instant-read thermometer registers 160 degrees in the thickest part of the breast, 20 to 25 minutes longer. Transfer the chicken to a cutting board. With potholders, remove the broiler pan rack; soak up excess grease from the potatoes with several sheets of paper towels. Remove the foil liner with the potatoes from the broiler pan bottom and invert the foil and potatoes onto a baking sheet or second cutting board. Carefully peel back the foil, using a metal spatula to help scrape the potatoes off the foil as needed. With additional paper towels, pat off the remaining grease. Cut the chicken into serving pieces and serve with the potatoes. I’ll be the first to admit this year that I didn’t do a great job of celebrating Jen’s birthday. She was out of town on the actual day and the following week was brutally busy for both of us. Valentine’s Day offered redemption, and, with the help of some great friends, I redeemed myself. It started a few weekends ago in Farmington, CT. Lee’s Mom treated Lee, Lynn, and me to a wonderful lunch and an afternoon of pottery painting. I decided to make something for Jen since we already have a lot of hand-painted serving dishes, trivets, and more from Jen’s bridal shower. We brought the pottery back to Boston, where Lee and Lynn took it to get fired. Yesterday at work Cathleen gave me some home-made fudge. Since I didn’t have any dessert planned out, I gladly accepted it. I’m glad we didn’t go out tonight; it was quite miserable outside. We enjoyed a wonderful dinner. I made bacon salad, high roast chicken with potatoes, and popovers (recipes and pictures to follow in the next few weeks). I served some chocolate-covered strawberries in my plate to go along with the fudge. From now on, Jen will be eating all of her meals out of the plate.